The chilly weather and gray skies did not deter the many families who turned out this morning at Burgess Park for the city of Menlo Park’s annual Easter festivities. 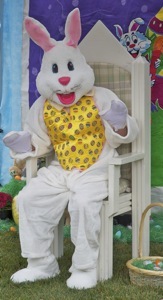 The event kicked off the with arrival of the Easter Bunny, who stuck around to to pose for photographs. The four egg hunts were broken into age groups, giving the young scavengers an equal shot at success in collecting up to five pastel-hued prizes. The morning’s activities also included an assortment of bounce houses, crafts, and rides on Old Tom, the Menlo Park Fire Protection District/s old-time fire engine. Previous post: Smart car with a snarl?